Children with cancer, or other serious illnesses, are typically not treated as “normal” by their doctors and parents; perhaps rightfully so. Their friends and fellow students may handle them with kid gloves knowing they are faced with a potentially life-threatening disease. As a result, this can affect these children to the extent that they lose their self-esteem and confidence as they go through the rigors of dealing with the treatments and cautions associated with their illness, and the reactions of those they interact with on a daily basis. 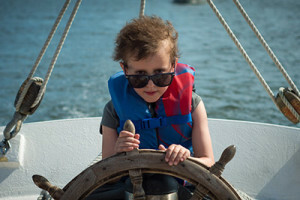 Similar to organizations like the Imus Ranch (for kids with cancer), Valiant Voyages has been established to give these children an opportunity to leave their illness behind for a while and take on a challenge that will give them a sense of self-worth, confidence and purpose – and have fun in the process. The Valiant Voyages program will bring these children out on the water, teach them how to sail, open their senses to the marine environment, and allow them to feel good about themselves and their accomplishments as they turn their attention to the demands of sailing Delphis, a 60-foot ketch, or Violet, a 45 foot Ketch. 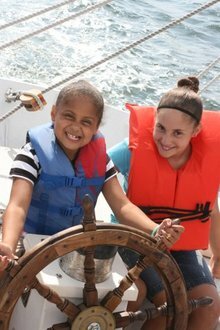 Before setting sail, the children will receive instruction on sailing and navigating. They will learn how to prepare to sail, shove off, hoist the sails, steer the boat, read the instruments and navigate the waters. In order to provide the necessary attention and safety required, up to six children will participate in each voyage. Each trip will last approximately two to three hours. At the end of the trip, the children will participate in bringing the boat into port and help with the docking procedures. As part of the program, parents and siblings can join in the adventure as well. Valiant Voyages is the dream of Tim Dokter, who bought Delphis in 1999 when he found her in dry dock in Westbrook, CT. At the time she was in sad, run-down condition. He saw the boat’s potential even in its dilapidated state and began its five-year renovation with love and dedication – and always with an eye towards taking out kids with cancer to give them the adventure of their lives. His experience as a scuba diver and a sailor on the Great Lakes and in the waters of Long Island Sound, plus his background in woodworking and home restoration, made him the perfect candidate to take on this challenge. He is also a former respiratory therapist and licensed paramedic, which has exposed him to the hospital environment and its strain on patients and families. Delphis is now a beautifully restored sailboat that captures the imagination of all who see her.